Dotter called it the “D.B.D.B-day Celebration” and hosted it at her new house. Yes, she and MuzicMan are homeowners, and I’m happy for them. If there was ever any doubt that they are grownups, that doubt has been replaced by a mortgage. Nothing like a mortgage to mature you fast! But I digress. My son Danno, who works on tug boats, missed his birthday with family back in July. His girlfriend, Brit, and The Captain had birthdays last week one after the other. Hence, the “Danno, Brit, Dad Birthday Celebration”. With my two oldest sons working erratic schedules on tug boats, we hardly ever have the opportunity to get the whole family together at one time. Somehow, it all worked out this time. I was compelled to buy everyone a gift, for some odd reason—even for Dotter, MuzicMan, Daboo, Miah and Termite, whose birthdays have either passed or are forthcoming. I thought long and hard about a little something I could get each one–something they would each enjoy. Unlike the stressful feelings I get around Christmas time of buying obligatory gifts that they might not want, or need, or like, I felt more freedom in the spontaneity of these gifts. I actually enjoyed buying them. 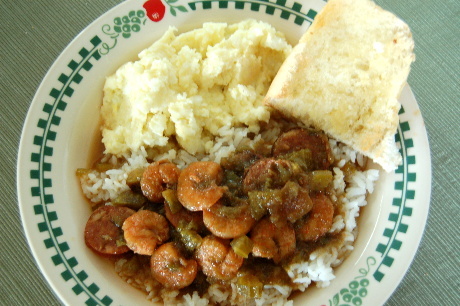 We had a delicious meal of Redneck Gumbo with a side of “creamy potato salad”, which when eaten together is our bayou version of mashed potatoes and gravy. 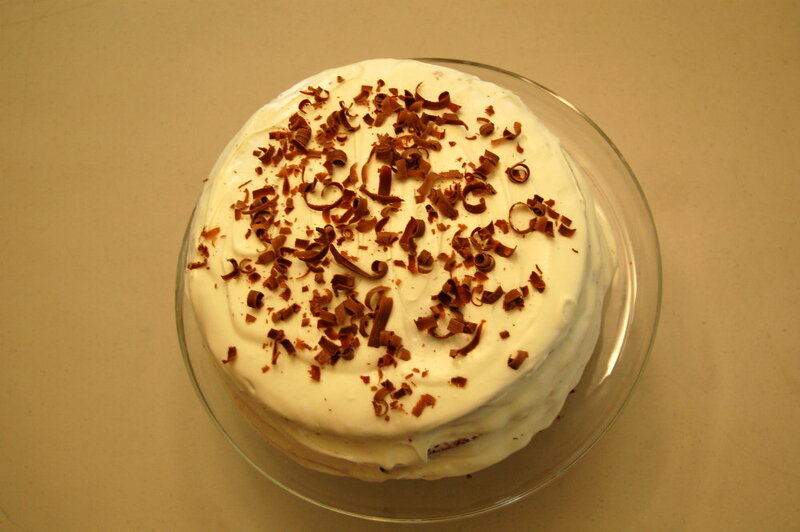 For dessert, Dotter baked (from scratch) a red velvet cake with cream cheese icing. What a beautifully delicious labor of love! While we were eating our cake, I asked Daboo and Danno if they would be home for Christmas. They both shook their heads and answered no, and then said “not for Thanksgiving, either”. And that, my friends, is what the gift-giving was all about. I’m glad I listened to my intuition, and I’m glad I brought my camera because I don’t know when I’ll have this chance again. Family get-togethers are the best. I’m glad you had a nice August Christmas. That red velvet cake looks scrumptious, but your mention of the potato salad is what got me. When I was over there I kept getting potato salad that was just “different”. Delicious, yes – but not like any potato salad I’d ever had. Now I know. It’s another regional specialty! That is correct about the potato salad. It is plain (no pickles no onions) to go with sauces and not the same as the kind of potato salad you would have with a barbecue or cookout. Dotter tried Yukon Gold potatoes this time as opposed to the red potatoes we usually use (potatoes make a difference, too) and it was EXTRA GOOD, soft, smooth, full of flavor. Yum! Sounds like my estranged family’s birthdays, everybody’s is between March 27 and April 27. I hated cake and ice cream for years. Enjoyed the cake pix. Couple stores here are pushing red velvet cakes now. A wonderful family photo. A belated Happy Birthday to your group. I have 2 next week, another 6 in September and then at least a couple a month until January! Dotter did a fantastic job on a cake that is a favorite of mine. Looks nice and yummy. So does the rest of the meal. What a wonderful time you must have had. I was really thinking about you yesterday but didn’t have internet to email you. Now I have to scrounge up some breakfast because the food in this post is screaming my name!!! Where were you yesterday without email? I was at home and couldn’t get my “smart” phone to access the internet. I’ve finally figured out how to use it as a modem for my laptop and it picked yesterday to refuse to do it! lovely pictures! Where’s the “like” button? hm, Sue, I don’t know. I noticed WordPress added that feature last week. Maybe they removed it already? Happy birthdays to all and thank you for the wonderful pics. The food looks so mouth-watering and the family looks happy and healthy! Blessings to all. Being with them, talking about their childhood memories, and laughing really is a blessing!!! Tell Dotter my dad’s BD is Thursday, and mine and my oldest son’s is Friday! Red Velvet would really be good! I too had no internet yesterday. We were in Mississippi at our property working (we did manage to fish a little yesterday and today). I didn’t even bring the laptop. There’s no one remotely close that we could tap into their router and internet access. It’s very rural. Our driveway is just over .2 of a mile long. Property in Mississippi sounds really nice! It’s nice but it’s also a MONEY PIT! We want even talk about the past 25 yrs. of neglect! Hubby and I have come to the same conclusion…we can’t work like we used to, especially in the heat. 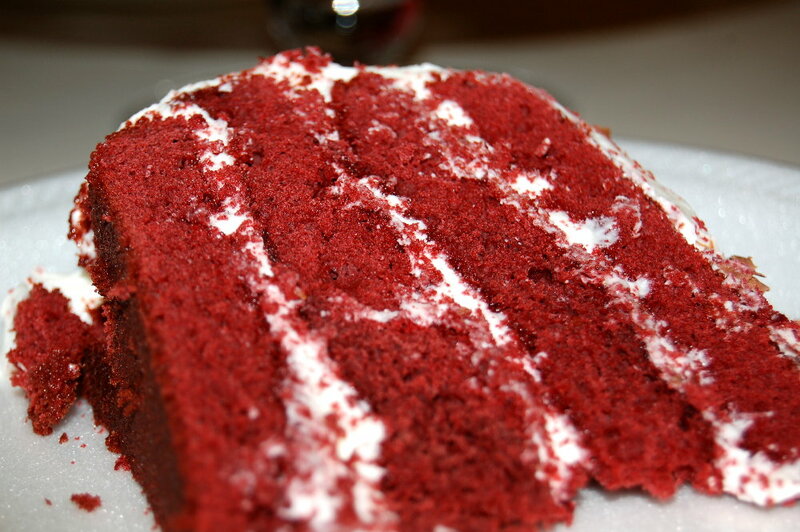 I was really impressed with the red velvet cake photo (beautiful and looks scrumptious! 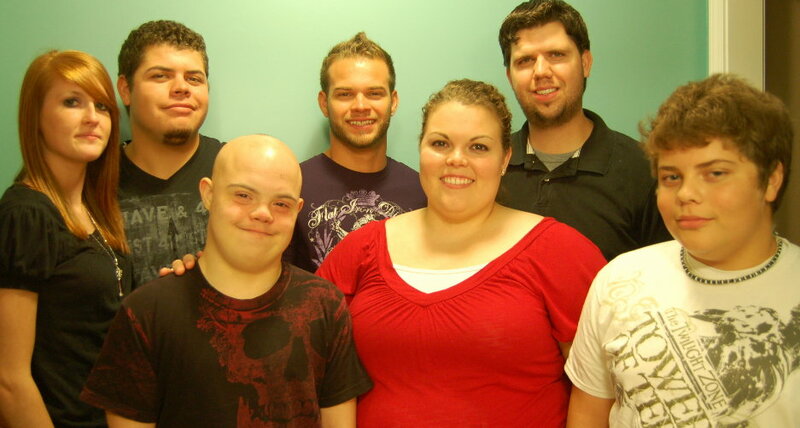 ), but then I finished reading and was even more impressed and touched by the photo of your beautiful family. I’m so glad y’all got to celebrate all together…that is a gift in itself. Well, I can’t take credit because the ring yelled at me from the shelf so loudly I had to take it!!! Steffi would have gladly taken a cake off your hands!